Hannah Genders suggests ways to create a wild garden area. Looking out from my studio, there is an area to the left-hand side of my garden that I call the woodland, which makes it sound much grander than it is really. But it is more of a wild area – when we moved into the house, there were a number of large trees including a Scots pine that had been really badly pruned and a eucalyptus which, I’m glad to say, died, as I then felt less guilty about removing it. I wanted to keep this area more natural in choosing what was planted, and to introduce smaller trees that would fit in better with the scale of a garden. Most of the trees were too large; they cast a lot of shade and had to be pruned every year due to some power lines running over the boundary. We took the plunge last autumn and had most of them removed, apart from a lovely copper beech that shades my studio in the summer months and another large beech that is in good condition. I can’t believe how much light it has let in to both my studio and the rest of the garden. I replanted the area with smaller trees like hawthorn (Crataegus ‘Paul’s Scarlet’), which makes a lovely tree and has a double pink flower. It does need some trimming up the trunk in the first few years to encourage it to be a tree and not a shrub, but as with a hedging hawthorn it flowers in the spring and has red berries for the birds in the autumn. I’ve also planted a white cherry (Prunus avium plena) which has double white flowers and grows to a lovely shape – it’s a slightly larger tree but ideal for most gardens. For underplanting I have used a mixture of hazels and Acers that give some dappled shade throughout the summer. All the leaves from the rest of the garden and off the lawn are blown onto this area so it gets plenty of mulch. 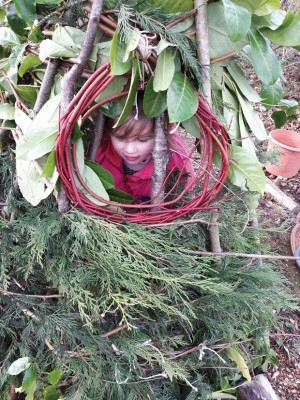 We have added a woodchip path through the planting to give more interest and allow you to walk through and enjoy it, and recently we built a den with our little granddaughter, all made from natural materials, which was great fun. Creating an area like this in your garden can be a haven for wildlife. I’m making log piles with anything that won’t burn in the woodstove and these also become great bug hunting areas when you have kids round. We are just planting up the area that backs on to the field with a native hedge. There are some plants already in but I’m filling the gaps to make the hedge more substantial. I’ve gone for a mixed hedge of hawthorn, dog roses (Rosa canina) and, for autumn colour, viburnum opulus. There is quite a lot of wild honeysuckle already in the hedge which will now take off since removal of the larger trees, but I’m adding more native honeysuckle (Lonicera periclymenum) to the hedge so that when walking along the path you will get that wonderful scent in the summer months. The whole hedge has been planted as bare-rooted whips so it was inexpensive. As this area is copying a native woodland structure, I want to copy the woodland flora on the floor, so I’ve added some foxgloves – and often move them from other areas of the garden where I don’t want them. You could go for the common pink flowered one (Digitalis purpurea), but there are also lots of cultivars with flowers ranging from pure white to soft apricot or yellow, and all of them are good for bees. Do be aware that they will revert to a pink shade when the bees do their work of pollination, but if you are just planting a small area, try one colour. I have also put in some other semi-native plants; that is, plants that are like the ones you would find on a woodland floor but maybe have something different in the leaf or flower colour. The arum lily (Arum italicum), which has naturalised in a lot of our woodlands now, has a marbled leaf – it can be invasive but if you are happy to let it ramble away it’s a wonderful plant in a shady setting, especially planted with bulbs. It has other common names like “Italian Lords and Ladies”, the origin of which I understand is too rude to write in a Village article! It is also very poisonous. I’m not particularly keen on the flower or seeds but I love the leaves which give interest in the winter months. Alongside the lily flowers I’ve planted plenty of hellebores; again, like the foxgloves, these will revert, but I’ve moved lots from other areas of the garden and I let them find their feet in this situation, which they seem to love and faithfully pop up every year through the leaves. The bulbs I’ve planted in drifts and these are left to naturalise. The small daffodil (Narcissus cyclamineus ‘February Gold’) which, as the name suggests, comes up each February, only grows to a height of 10cm but is a great plant to herald the spring. For autumn colour I’ve planted the ivy-leaved cyclamen (Cyclamen Hederifolium) and these are really starting to take off this year and spread. Like the Arum lily, the leaves are beautiful just on their own too. One of my other favourite bulbs that I have seen grown in a naturalised setting is Camassia, so this autumn I’ve put in plenty of the blue-flowered one, Camassia quamash. The flowers are formed on spikes in May and June and will sit well above most of the foliage at around 60cm – they won’t tolerate full shade but in semi-shade or sunny areas they should multiply well. I’m really looking forward to seeing how this area develops during the year once the plants fill out and the trees get going, and of course, den-building and bug-hunting too!